Last night I was especially tired. I had gone on a long run yesterday morning and a ended up staying late at work. By the time I got home, I was hungry and wanted something quick to eat. Good thing that while I was out in the field for my job, I went passed one of the best Mexican bakeries in Tucson, Estrella bakery. This place has the best tortillas! They are so authentic and delicious. If you are ever in Tucson, you must go to this little, humble bakery. Armed with delicious tortillas and a can of vegetarian refried beans in the pantry, all I needed to make was some delicious rice for an amazing bean burrito. I am kind of on a saffron kick right now, so I decided to make yellow rice. I used Arborio rice because the brown rice I had in my pantry was just not going to work for this. Arborio rice is usually for risotto but cook it like regular rice and it is still has a nice tender texture without the creaminess. 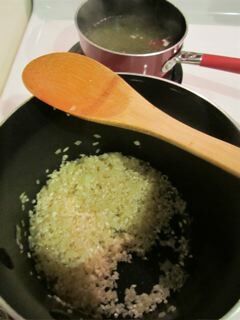 I started out with some oil in my pan and sauteed garlic, white onion and the rice until the rice was slightly toasted. Meanwhile, I steeped some saffron threads in salted water. Once the rice was toasty, I poured in the saffron water, brought it all to a boil, then covered the pan, and cooked like regular white rice. Yum! It came out sooooo good and it only took about 15 minutes. 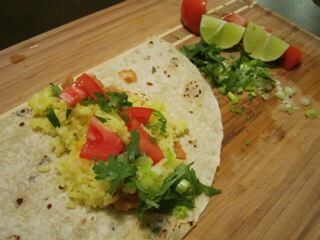 I cut a tortilla in half then spread the refried beans, put on the rice, added some chopped cilantro, green onions, and fresh tomato – done! Delicious weeknight dinner perfect for taking in front of the TV to eat while I watch New Girl. I went ahead and made a burrito on a full tortilla with the same ingredients so I can have it ready for my lunch today. I am going to take some salsa in an empty baby food jar and I’m sure I’ll be the envy of the office. I skipped my morning run today for an extra half hour of sleep but will show my body some love later with an hour of yoga. Happy Wednesday! Previous Previous post: Taste the rainbow! Next Next post: T-G-I-F !! !